So it truly seems that the Lovand case is behind us as the rest of season 2 of Burden of Truth is focused on proving Luna’s innocence. We open with Luna being processed and Joanna fretting outside with Billy. Mercer starts to interrogate Luna without her lawyers and Luna not knowing any better wants to get her side of the story out and pleading her innocence. On the other side of the glass is Owen who immediately gets Joanna to “barge” in and tell Luna to stop talking. At Luna’s bail hearing, Joanna tells the judge of how exemplary a student Luna is a good in her community. The Crown argues that Luna’s girlfriend recently got a $2 million dollar settlement and the fact that she and her mother were about to run away, which makes her a flight risk. The judge agrees and bail is denied. 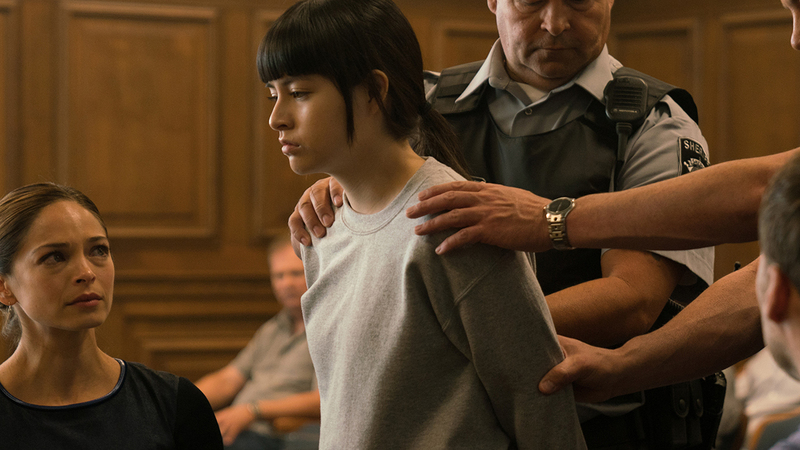 Outside the courtroom, Billy still thinks it is a bad idea for Joanna to represent Luna and wants to bring in an experienced criminal defence attorney. Joanna refuses to step down as she believes she is the right person to represent her sister. Unfortunately, Owen is not so lucky as Mercer pulls him off the case much to his chagrin. Luna is then taking to a detention centre that Joanna thought was long de-commissioned. Luna gets a not-so friendly welcome from her cellmate but she later offers her advice on how to cope her first night. And later during a courtyard game of basketball, a fellow inmate punches Luna and the cellmate flies to her defence and starts a fight. Back at Billy’s office/house, he and Joanna go over the existing evidence the Crown and police have. The deck is stacked against Luna as the two look at all possible angles and suspects to no avail. Billy asks once again if they should bring in an expert but again Joanna refuses. Making matters worse is Taylor. However, at first Taylor thinks she is helping Luna’s case because she journaled that David was still alive after the argument with Luna. Matheson tells Taylor to stay out of it but she refuses and goes to the police. But what ends up happening is one journal entry makes it out that she was an accessory to the murder and drove back to Millwood with Luna so she could kill David. Matheson advises Taylor that she testify against Luna so she won’t get charged and that seems to be what is going to happen. Owen calls Billy and Joanna to tell them the bad news. With this bombshell, the two know that Luna will be charged with first degree murder and 25 years in jail. Billy suggests a plea deal and Joanna is reluctant to use this option. Billy visits the Crown and ends up with a deal of Luna being charged manslaughter 1 and 4 years in jail. Gerrilynn goes and sees her daughter and tells her about the plea deal. Gerrilynn thinks Luna should take it as 4-years is better than 25 and Luna can still have a good life. Molly also pays a tearful visit with Luna. Based on advice from her cellmate, Luna breaks up with Molly as she knows they won’t survive her being in jail whether it is for 4-years or 25. Even though Owen is off the case, he is still willing to do anything for Luna and gives Joanna and Billy the police file on the crime scene. Joanna gets the motel manager to let her back into the room where her dad was murdered to recreate the night. Joanna walks to the liquor store but alas they delete all security footage of the last 24 hours. Thinking she is back at square one, Joanna is back at the motel room and comes to realization that the killer was waiting for David even while the argument with Luna was happening. Joanna notices a bar that has a perfect view of the motel. Joanna visits the bar and learns from a bartender that a nervous woman with a fake id from California was there on the night of the murder. The bartender noted that it was not Luna. Joanna tells Luna this and Luna wonders if she should take the plea deal. Joanna offers her pros and cons of both but will stand by any decision Luna makes. At Luna’s supposed sentencing hearing, she turns down the plea deal and pleads not guilty.